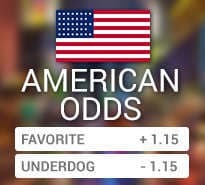 American Odds Explained - What are American odds in Sports Betting? American odds are primarily used by sites that cater to US sports bettors, also know as “moneyline odds” they are the odds most often used for moneyline betting for American sports bettors. American odds are probably the easiest to understand as odds represent how much the bettor will have to wager to win $100. Favorites come with a – symbol attached. The higher the absolute value of the number, the better the chance the bet will win. So for example a -200 favorite has a better chance to win than a -120 favorite. 200 is greater than 120 so this is what we mean by absolute value, you ignore the – sign and take just the number when considering this. Underdogs come with a + symbol attached. The higher the number, the larger the underdog. So a +200 underdog has a better chance to win than a +500 underdog. What Do The Odds Mean? American Odds always use a baseline value of $100. For favorites you are always risking the money to win $100, and with underdogs you risk $100 to win the amount. A -135 favorite means you must risk $135 to win $100 from the sports book. So you either lose $135 or win $100, or push. A +350 underdog means you risk only $100, but you win $350. You either lose $100 or win $350, or push. American Odds can easily be converted into other odds such as decimal or fraction, using our free online calculator. Most, if not all, sites also offer odds in those formats, by simply choosing your preferred format. We can also convert American Odds into percentages. This is useful because it gives you a breakeven % that you need to achieve long-term to win when betting certain odds. The most common odds are -110 so we will use that. The question to ask is “how often will we need to win, when betting at -110 odds, to break even?” The answer is “enough so that you turn 110 into 210 often enough to overcome the juice” but it is expressed in percentages. So we take our $110 risked, divided by the ultimate $210 payout if our ticket cashes, and come up with .5238 or 52.38%. This means you must win at least 52.38% of your bets at -110 to break even. Another example will involve underdogs. Let’s say we have a +200 underdog. How often do they have to win for us to break even? We take a $100 risk and divide by the ultimate payout of $300 and get .3333, or 33.33%. So any +200 underdog that wins 34%+ of the time is a profitable bet. The American odds will give the bookmaker influence over the point spread without changing the key number of 3. Odds worse than -110 as we discussed can hurt your breakeven percentage and should be taken into account even when betting spreads. On the other hand, underdog plus odds will help your bottom line. American Odds are convenient and fast once you get accustomed to them. Just like any other format, it is all personal preference. It is also easy to convert American Odds to fractional or decimal odds and can easily be done using our online odds converter.